Nearly nine years into the current economic expansion Federal Reserve policy actions appear to be benign, as even after six increases, the federal funds rate remains less than 2%. Changes in the reserve, monetary and credit aggregates, which have always been the most important Fed levers both theoretically and empirically, indicate however that central bank policy has turned highly restrictive. These conditions put the economy’s growth at risk over the short run, while sizable increases in federal debt will serve to diminish, not enhance, economic growth over the long run. Interest rates are not predictable over the short run but are controlled by fundamental forces on a long-term basis. Milton Friedman (1912- 2006) developed the most complete and internally consistent interest rate model to date, which is an extension of the Fisher equation. Friedman’s model reaches two conclusions: (1) although monetary decelerations may lead to transitory increases in interest rates over the short run, they ultimately lead to lower rates; and (2) monetary accelerations result in higher rates. This reasoning is based on what Friedman termed “liquidity, income and price effects”. When the Fed reduces the reserve, monetary and credit aggregates (or what Friedman called monetary deceleration), initially short-term rates are forced upward through the “liquidity (or initial) effect”. As the Fed further tightens monetary conditions, an offsetting “income effect” follows. These restraining actions moderate growth in the economy, and the rise in interest rates continues but at a slower pace. Thus, in Friedman’s terms, the income effect begins to offset the liquidity effect. When the Fed sustains the tightening process long enough, the inflation rate will decrease as incomes fall and ultimately result in lower rates. This is the “price” or “Fisher effect” from the Fisher equation. Observationally, the highly inflation-sensitive long-term yields reflect the changing economic landscape faster than short-term rates, thus the yield curve flattens, serving to strengthen the Fed’s restraint on the reserve, monetary and credit aggregates. Empirical studies by Friedman and others indicate this process is lengthy, often playing out over several years. This process appears to be well underway. More than two years have elapsed since the Fed initiated the liquidity effect, and restraint is evident in all of the aggregates as well as in the shape of the yield curve, which has attened significantly. Friedman's logic for monetary accelerations leading to higher interest rates is the opposite of monetary decelerations. When the Fed accelerates growth in the reserve, monetary and credit aggregates, the liquidity effect is initiated. Short term rates drop rapidly relative to long term rates and the yield curve dramatically steepens. If the Fed continues to further loosen monetary conditions, a reversing income and price effect can, but does not always, occur. Friedman assumed the velocity of money was largely stable. Subsequent empirical evidence, however, suggests that this is not the case. Three important concepts arise from these patterns. First, when the Fed moves in one direction, they ultimately lay the groundwork for reversal. Second, considerable time (generally two or more years) passes before the liquidity effect has any economic impact. Third, these lags grow longer when the Fed tries to overcome a recession, especially in highly leveraged economies like 1929 and 2008. The fact that there is such a long lag between policy change and economic impact is critical in analyzing the circumstances today. For instance, suppose the Fed is able to identify the next recession on day one. Also, suppose that on the first day of the recession the Fed drops the federal funds rate to zero. Due to the economy’s extreme over-indebtedness, along with long monetary policy lags, a minimum of one and half years could elapse before even a slight economic recovery is experienced. But, recovering from the next recession, the lag could be much longer since interest rates are so close to the zero bound and indebtedness continues to rise to record levels. Both will interfere with the potency of the liquidity effect. Thus, despite a rapid Fed response, a long recession could ensue. 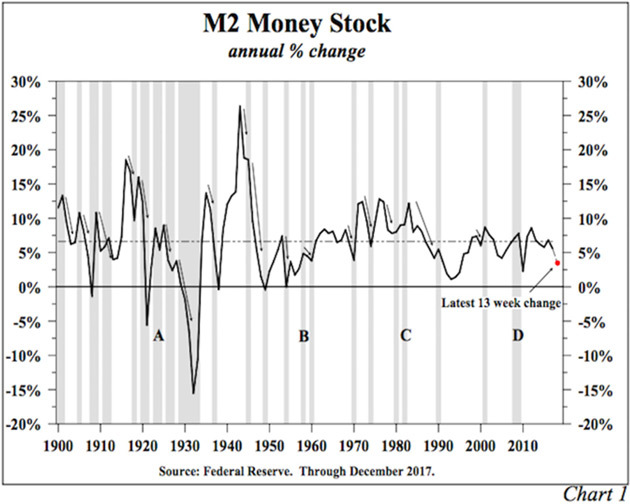 Since the early 1900s, money supply (M2) decelerated prior to 17 of the 21 recessions (Chart 1). This strong correlation is remarkable given the complexity of the economy and shifting initial conditions. The lead times between the peaks in M2 growth and the start of the next recession are variable, with many centered around two years; however, some are shorter and others are as long as three years. The variability in lag times is far from surprising due to widely varying initial conditions: degree of leverage, demographics, global conditions and a host of other variables. When an economic model does not fully explain all of the historical experiences, the best approach is to study the cases that appear to contradict the normal pattern. The four deviating instances are labeled A, B, C, and D (Chart 1). At point A, the money supply did not decelerate prior to the 1923 recession, but money velocity fell as the economy became increasingly leveraged. (This is important because the equation of exchange posits that money times velocity equals nominal GDP (M*V = NGDP).) The treasury yield curve significantly flattened and so did the corporate yield curve, which at the time was a more important indicator. At point B, M2 did not decelerate prior to the 1958 recession. In this case the rate of growth in the monetary base sharply decelerated along with bank credit. Additionally, the treasury yield curve inverted. At point C, if the 1980 and 1981-82 recessions are counted as one recession, as many prominent economists suggest, M2 growth did decelerate sharply prior to the downturn. Moreover, all of the monetary variables denote that severe restraint had been initiated to contain double-digit inflation. In other words, no contradiction existed as monetary policy tightened, and then the economy collapsed. At point D (or prior to 2008), M2 growth did not decelerate until the economy was already in recession. However, the entire set of other monetary variables was restrictive. Therefore, in the four instances when M2 growth failed to signal the downturn, M2’s closely aligned partners, on balance, pointed to recession. M2 is largely measured from the liability side of bank balance sheets. Bank credit, which includes loans and investments or security holdings, is the aggregate of bank assets. Economists Karl Brunner (1916-1989) and Allan Meltzer (1928- 2017) developed the money supply determination model used in all major macroeconomic texts. This algebraically proven model states that M2 equals the monetary base times the money multiplier (m). Since late 2015, in large part due to the Fed’s actions of raising the federal funds rate and more recently reducing the Fed balance sheet (quantitative tightening or QT), the monetary base has registered a pronounced decline of 6.3%. Excess reserves of the depository institutions fell by more than 16% over this time. Part of this decline may be attributed to other volatile factors rather than to changes in the Fed’s balance sheet. Taking these factors into account and smoothing out fluctuations in excess reserves, it appears that each increase in the federal funds rate required that excess reserves decrease by approximately $68 billion. This accounts for the approximate $410 billion decline in excess reserves. Due to quantitative tightening, the Fed balance sheet was reduced by $57 billion in the past two quarters. Using excess reserves, rather than the fed funds rate, as a measure of Fed tightening, we conclude the Fed has engaged in the equivalent of closer to seven increases in the federal funds rate rather than the six increases reported. This exercise is to highlight that the Fed policy of reducing its balance sheet is measurably more restrictive than their stated policy tool (fed funds). At the start of the first quantitative easing (QE1), Fed Chairman Bernanke said the Fed was printing money. 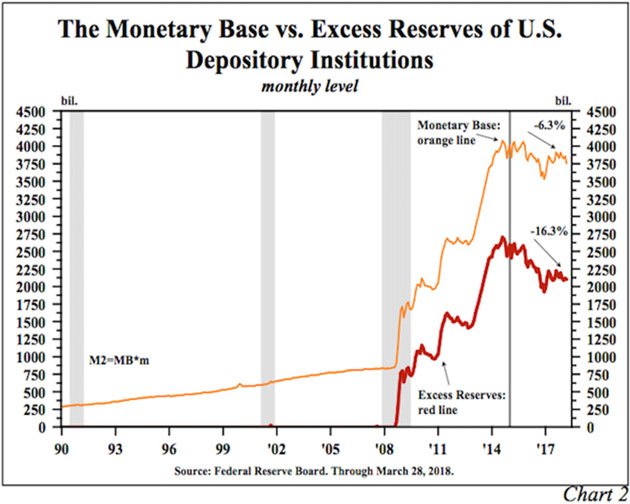 Due to the Fed’s balance sheet, the monetary base surged, but M2 did not respond due to the decline of m. (Remember, m is the equal partner to the base.) Some might presume that if m declined during QE, it would rise during QT. But currently the determinants of m – excess reserves, time and savings deposits, currency, and treasury ratios – have worked in tandem to cause m to stabilize. Thus, together, reductions in the base and m have caused the rate of growth in M2 and commercial bank credit (the sum of loans and investments) to slow noticeably. Until the Federal Reserve Act of 1937 is repealed, m will remain algebraically defined. The Fed can neither print money nor reverse the printing press. The Federal Reserve can raise or lower the monetary base, but no certainty exists that there will be a correspondingly desired change in the money supply or bank credit, unless m cooperates. Conclusively, the Fed’s balance sheet and m are of equal importance. The widely held presumption that the Fed policy of QE would work, reflects that the Brunner-Meltzer model was not properly understood. In the first quarter of 2018, M2 growth decelerated to just above a 2% annual rate. Year- over-year M2 growth slowed to just 3.9% versus the 6.6% long-term average growth. Additionally, bank credit growth declined 0.6% at an annual rate. Loans continued to inch upward but only because the banks’ securities portfolios fell. Loan volume does not typically fall until an economy is in a recession because firms borrow to finance an unintended rise in inventories. The proposition that the federal funds rate is the major policy tool to control economic activity is greatly flawed. As the past ten years have proven, the Fed faces a difficult task of working with both price (interest rate) and quantity (money supply) to influence economic activity. Present circumstances reveal extraordinarily low money growth, tighter bank liquidity (Chart 2), and the inability of several sectors to borrow due to higher rates. The historical record of these Fed actions points toward a continuing pattern of economic deterioration. While the brunt of monetary policy will impact economic growth increasingly over the next two years, the longer run view of economic conditions will be shaped by the exploding level of government debt. Federal debt continues to rise at an accelerating pace, a trend reinforced by the bipartisan budget enacted March 23rd of this year and the tax cut and reform legislation that went into effect January 1st of this year. These changes occur at a time when many expenditure items have been moved off-budget, causing a wider gap between the issuance of debt and the reported deficit (note: in the last ten scal years, the cumulative budget deficit has been $8.5 trillion while government debt has increased by $11.3 trillion). Additionally, an aging population is set to greatly boost federal debt over the next 15 years. Gross federal debt was 105.4% at year-end 2017, but it could reach 120% before the end of the next decade. The economic impact of this explosion in debt has been analyzed through a plethora of academic articles. The most germane might be the Checherita and Rother 2010 study which shows that excessive indebtedness is deleterious for economic growth in a non-linear fashion. That is, the higher the level of debt the greater the restraint on economic growth. While many believe that surging debt will boost economic growth, the law of diminishing returns indicates that extreme indebtedness will impede economic growth and ultimately result in economic decline. Diminishing returns is about economic growth and thus highly important in economics since the standard of living cannot be raised without increasing output. The application of diminishing returns means a disproportionate growth in debt will produce similar results for all countries in extreme debt, regardless of their idiosyncratic conditions. 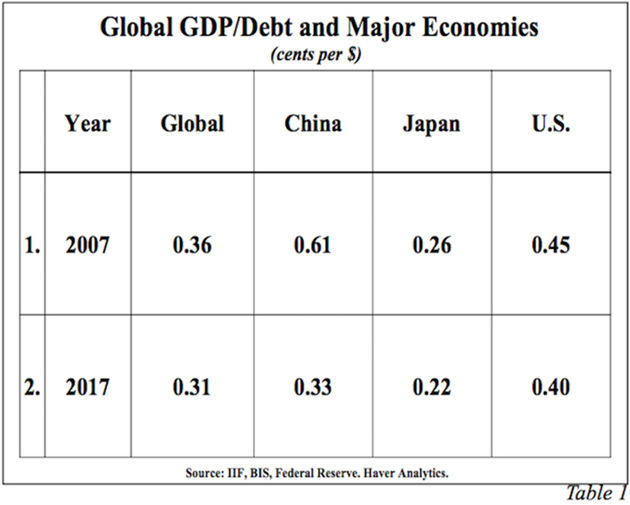 Thus, no matter how U.S., Japanese, Chinese, European or emerging market debt is financed or owned, and regardless of the economic system, the path is stagnation and then decline. Even central bank funding of debt will not negate diminishing returns. The law of diminishing returns rests upon the production function that states physical output on either a micro or macro scale is a function of the inputs. These inputs – labor, capital and natural resources – are called the factors of production. When a factor of production input (for instance, debt capital) goes up, output rises at an increasing rate and marginal physical product (MPP) also increases. However, as that factor disproportionally continues to increase, MPP experiences slower gains and diminishing returns occur, followed by flat returns. As debt continues to increase, real GDP starts to fall. At this point, debt has reached the point of negative returns, resulting in the end game of extreme indebtedness. Faltering output will free up substantial credit in more than sufficient volume to overwhelm the impact of the ever increasing supply of new debt. Although the business and financial cycles will continue to operate, low interest rates will prevail as debt is used in ever increasing amounts to boost economic output. While labor, natural resources and equity capital theoretically could increase proportionately with debt capital, these levers are not easily changed and their trends are not positive. Poor demographics in Europe, Japan, the U.S. and China suggest labor will not be a major positive for almost two more decades, even under the most optimistic of scenarios. Equity capital is moving in the wrong direction due to low net U.S. savings along with corporate preferences. Technology will change, but the more deleterious impact may fall on labor and natural resources. Thus, overuse of debt capital is the path of least resistance. The law of diminishing returns holds important implications for both recent and future fiscal policy actions that have increased, and will continue to increase, federal debt. Suppose that during the next recession the economic solution is assumed to be an even more massive rise in debt than the $3.5 trillion explosion that occurred during and after the recession of 2008-09. This policy will result in even smaller economic gains than in the current expansion. If debt increases are doubled, tripled, or even quadrupled, the law of diminishing returns indicates economic growth will become even more frail. All economies rely heavily on the business sector to lead the growth process. Yet, a sharp decline in GDP per dollar of business debt occurred in the U.S. during the past nine years, reinforcing the underlying trend since the early 1950s. In 1952, $3.42 of GDP was generated for every dollar of business debt, compared with only $1.39 in 2017. In the corporate sector, where capital as well as technology is most readily available, GDP generated per dollar of debt fell from $4.50 in 1952 to $2.50 in 2007 to $2.21 last year. The dismal trend in productivity confirms this conclusion. The percent change for productivity in the last five years (2017-2012) was equal to the lowest of all five-year spans since 1952. It was also less than half the average growth over that period. Important to the long-term investor is the pernicious impact of exploding debt levels. This condition will slow economic growth, and the resulting poor economic conditions will lead to lower inflation and thereby lower long-term interest rates. This suggests that high quality yields may be difficult to obtain within the next decade. In the shorter run, in accordance with Friedman’s established theory, the current monetary deceleration, or restrictive monetary policy, will bring about lower long-term interest rates. IN JANUARY A food bank in Essen, an industrial city in western Germany, unwittingly caused a political storm by requiring each new claimant to present a German identity document. Three-quarters of users were foreign, explained Jörg Sartor, the food bank’s boss; surely that was unfair to locals. First came protesters who daubed “racist” on his vans. Then the far-right Alternative for Germany (AfD) party threw its (unsolicited) support behind him. Cameramen and reporters arrived. Other politicians waded in on all sides. Even Angela Merkel gave her verdict: it was “not good” that Mr Sartor had chosen to distinguish between Germans and others. In early April he lifted the ban on foreign users. The incident reflects a widespread feeling of what Mrs Merkel has called Unbehagen, not easily translated but meaning anxiety or unease. A country that long equated belonging with having four grandparents with German names, and treated many immigrants as temporary visitors, has seen a massive influx of foreigners following the chancellor’s decision in 2015 to keep borders open to refugees and asylum-seekers. At the same time Germany’s traditionally egalitarian “social market economy” is becoming more polarised as globalisation buffets old industrial centres like Essen; hence the food Banks. Speaking at a conference of her Christian Democrat (CDU) party in Berlin in February, Mrs Merkel argued that this had affected the German election on September 24th last year in three ways: voters felt Unbehagen about the state’s ability to cope with crises like the massive influx of refugees; about the country’s economic future; and about the state of the wider world. That was a fair summary of the mood in the country she has run for more than 12 years. The chancellor was trying to explain why her centre-right Christian Democratic Party and its Bavarian partner, the Christian Social Union (CSU), had suffered a drop in their share of the vote to a post-war low of 33%. Her partners in the grand coalition that has run the country for eight of her 12 years in power, the centre-left Social Democrats (SPD), also saw their support fall, from 26% to 21%. The anti-immigration AfD, formed only in 2013, took third place with 13%. An unprecedented five months of coalition wrangling to form a government ended only on March 4th when SPD members voted to support a new grand coalition with the CDU/CSU. Herfried and Marina Münkler, a pair of academics and writers, capture the mood of today’s Germany in their book “The New Germans”. Ostensibly a profile of the hundreds of thousands of newcomers, their account makes a wider argument: even ordinary Germans without migrant roots are changing. 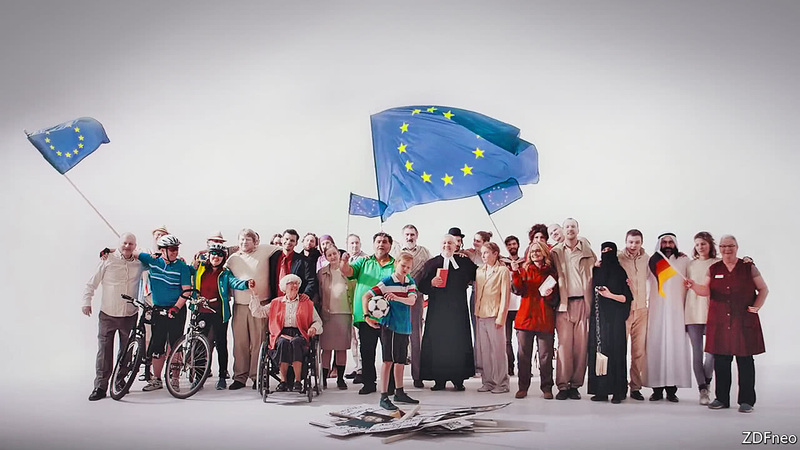 “The order of the static” in Germany, the Münklers argue, is giving way to more fluid relations and “an end to stark national borders”, exposing the country to economic, social and technological changes abroad. A hitherto hidebound place is turning into something more informal, more open and more varied. The biggest single reason is the huge influx of refugees and asylum-seekers, which peaked in the summer of 2015. Mrs Merkel famously vowed to keep Germany’s borders open to hundreds of thousands of newcomers, though later she tightened up the rules. In 2015 and 2016 a total of 1.2m people arrived, a significant addition to the population of 81m. But the old vision of what it means to be German was already being challenged by earlier arrivals. In last year’s election, for example, the share of MPs with a migrant background rose to 8%, up from 3% in 2009 (though it would have to go up to 23% to be truly representative of the population). The Unbehagen also reflects deeper trends. “Germany is in the process of a great transformation into a more plural society,” says Marcel Fratzscher, director of the German Institute for Economic Research in Berlin. Church attendance is declining. People are divorcing more and marrying less (apart from gay couples, who were finally given the right to wed last year). A patriarchal country is slowly becoming more gender-balanced. Mrs Merkel’s governments have greatly increased the availability of child care, introduced quotas for women on company boards and boosted wage transparency. In the past 15 years the share of working-age women with jobs has increased from 58% to 70%. But not everyone approves. A cultural divide is opening up between urban regions and more conservative suburban and rural areas. “Cities like Munich, Cologne and Berlin now have more in common with each other than with their own hinterlands,” says Michael Bröning, author of a new book on nationhood. And rising crime rates and cultural battles like the one in Essen are making society feel more raw. On New Year’s Eve 2015 in Cologne some 1,000 women were sexually assaulted by a crowd made up largely of immigrants. A year later an Islamist terrorist from Tunisia drove a hijacked truck into a Christmas market in Berlin, killing 12. The titles of recent books and films—“Nervous Republic”, “Fear for Germany”, “The End of Germany”—capture the public mood at its gloomiest. Economically, the new Germans are sitting comfortably. The country has a record trade surplus and record low unemployment and enjoyed a budget surplus of €37bn ($47bn), or 1.1% of GDP, last year. Yet even here Unbehagen is creeping in. 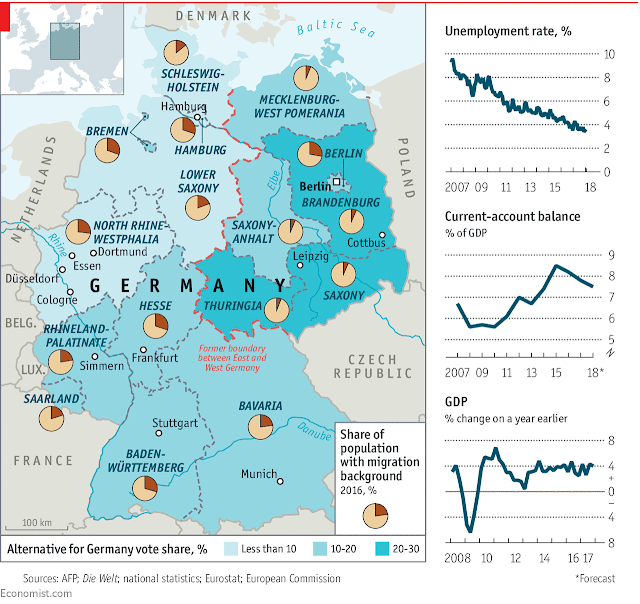 Globalisation and technology are hollowing out the German labour market and creating new divides between haves and have-nots. And Germany’s mighty engineering industry, the very driver of its prosperity, is being disrupted by new technologies and competitors that upend old business models. At the same time the world’s expectations of German defence and foreign policies are running ahead of what its citizens are willing to endorse. When Donald Trump was elected America’s president in 2016, Germany, though reticent on the world stage and pacifist in its instincts, was hailed as the “new leader of the free world”, thanks partly to its role in the refugee crisis and partly to its credentials in a Europe where France looked weak. But it was not what the Germans wanted. The election of Emmanuel Macron as president has provided them with a more equal partner in Europe, though his ideas for an integrated euro zone make them deeply uncomfortable. The 10-year U.S. Treasury yield rose above 3 percent for the first time since January 2014, snapping out of a months-long trading range amid an onslaught of supply and a Federal Reserve intent on boosting interest rates. The yield rose as high as 2.95 percent in February, before retreating into a range for the past two months. But the prospect of a deluge of new government debt has weighed on the $14.9 trillion Treasuries market. It climbed as high as 3.0014 percent on Tuesday. The U.S. budget deficit will surpass $1 trillion by 2020, two years sooner than previously estimated, the Congressional Budget Office said this month. At the same time, the Fed is trimming its balance sheet, meaning the amount of net new debt ispoised to surgein the years ahead. Treasury hasaskedprimary dealers to give forecasts for America’s borrowing needs over the coming three fiscal years, ahead of the next quarterly refunding on May 2. Yields were already heading higher at the start of 2018 amid Fed rate hikes, and policy makers have shown no signs of slowing their tightening even withU.S. stock marketsfluctuating in recent months. The increase in longer-term Treasury yields interrupts arelentless flatteningof the U.S. yield curve seen in recent months. Central bankers expressed concern this month that the curve was headed toward inversion, a phenomenon that has historically served as a harbinger of recession. Fed officials’ most recent forecasts are for two additional rate increases in 2018. Traders are pricing in slightly more than that. Is the Yuan in China’s Trade-War Arsenal? China’s new top central banker says Beijing won’t use yuan depreciation as a weapon in a trade fight. Should investors believe him? A sharp, deliberate devaluation—as in 2015—would be risky, given the country’s rickety financial system. 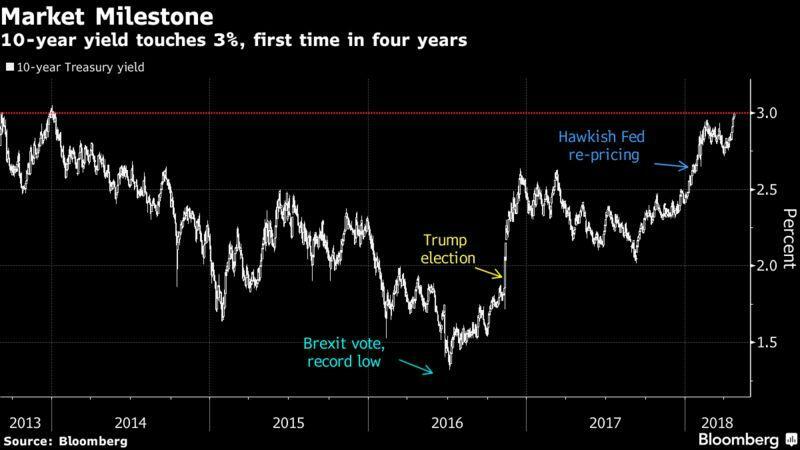 But there is reason to think the currency might come under pressure later in 2018 anyway, and that could be misinterpreted as provocation by a hostile Trump administration. The yuan’s current stability against the dollar is more fragile than it appears. Markets read its rebound in 2017 as a testament to China’s new capital controls, with an assist from the weaker dollar. 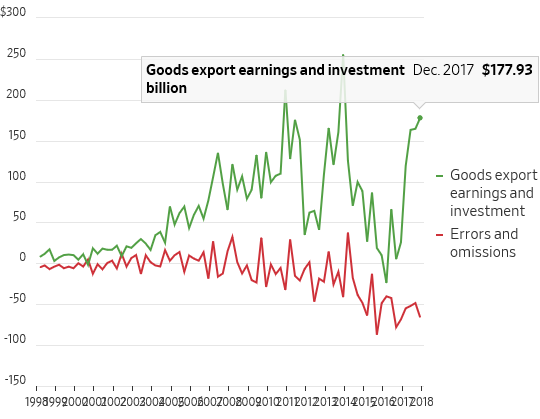 But two other factors were critical: First, China’s net exports rebounded sharply, providing a shot in the arm as exporters sold dollar earnings for yuan. And second, foreign investment capital moved back into the country as the economy improved and a crackdown on leverage pushed up interest rates. Unfortunately, there’s not much evidence any of this has curbed Chinese hunger for foreign assets. Logan Wright, China markets research director at the Rhodium Group, notes that the “errors and omissions” term in China’s balance of payments—one good indicator for capital flight, as it partly reflects money moving in or out of the country through unrecognized channels—is still negative. It has moderated only slightly since 2016. In other words, a lot of Chinese capital is still eyeing the exits: If global trade falters and U.S. rates rise, China’s currency could be in for another test sooner than many expect. And that’s worrying given how much money is sloshing around in China. China’s foreign-exchange reserves sound large—$3.1 trillion—but they are dwarfed by domestic money supply, at nearly $30 trillion. If even a small portion of that capital finds its way out through the cracks, and the central bank steps in to prop up the yuan, those reserves could run down in a hurry. With the yuan, and China’s financial system, still vulnerable to renewed outflows, a sharp, deliberate depreciation to bloody the U.S.’s nose would be risky—particularly with U.S. inflation and rates now steadily rising. Yet a gradual depreciation might be in the cards this year if global trade momentum slows, as many expect, and China loosens monetary policy to goose the economy. If every jobless worker in the U.S. could be matched with every available job, the unemployment rate would fall to near zero. That will never happen in reality, but the jobs are there. 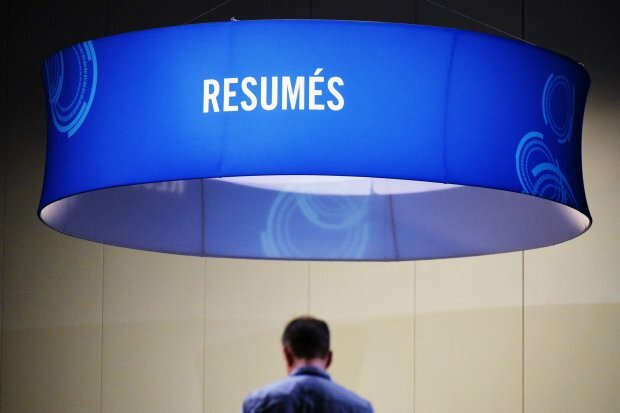 On Friday, the Labor Department reported that there were 6.1 million open jobs in the U.S. at the end of February—0.9 for every unemployed worker. That compares with 0.75 per unemployed worker a year earlier, and 0.15 when the recession ended in 2009. And, in a sign that companies are struggling to fill positions, the share of hires per job opening is near an all-time low. It seems like a recipe for higher wages—and indeed, there is plenty of anecdotal and survey evidence that wages are rising. But the increase, with average hourly earnings up 2.7% in March from a year earlier, is surprisingly low. One view is that there are lots of potential workers who aren’t looking for work, and therefore aren’t counted in the unemployment rate. This hidden labor market slack is acting as a sort of pressure valve on wages. Over the past two years, there has been an uptick in the share of so-called prime-age people—those aged 25 to 54—who are working or looking for work. 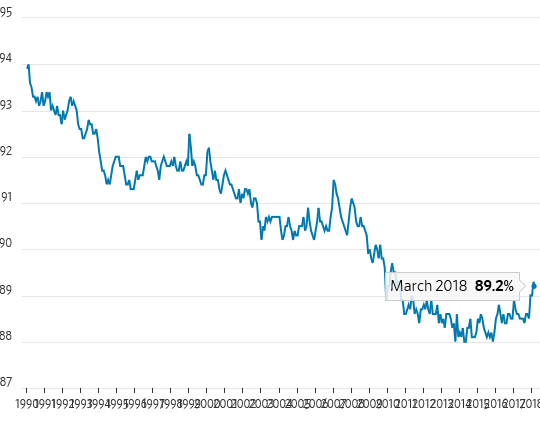 This increase in prime-age labor participation has been particularly notable among men lately, rising to 89.2% in March from 88.6% a year earlier. It was 90.9% when the recession started, so perhaps there is more room to run. But an analysis of job flows conducted by JPMorgan economist Jesse Edgerton suggests this increase in participation has come from people staying in the workforce longer rather than workers coming into the labor market. That has kept the job market from getting so tight that wages take off. But without that vast pool, companies will have to do something to fill those available jobs. Paying people more almost always works.